Above: a dune slack at Newborough Warren National Nature Reserve with a vast colony of Marsh Helleborines. The similarity of this orchid to its more exotic tropical cousins perhaps accounts for the view that this is one of the most beautiful of our Europeanwild orchids. The flower appears in two colour forms. Epipactis palustris grows to around 30cm in height. It has 5 or 6 sharpy pointed leaves sheathing the base of the stem with further narrower bracts among the flowers. Unlike other Epipactis species this plant has very attractive and brightly coloured flowers which are either brownish-purple or creamy-green. The base of the lips of the flowers are marked with dark purple-to-red veins, and the outer edges are somewhat 'frilly' in appearance. Epipactis palustris is widespread thoughout the UK and Ireland. In Wales, which is one of its strongolds, there are some excellent places to see this lovely wildflower. 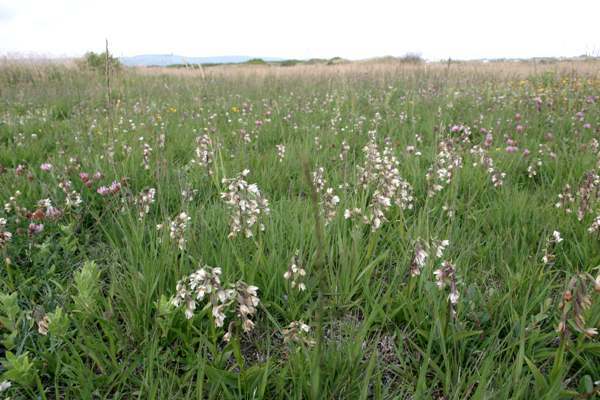 Two of the most notable are Kenfig National Nature Reserve in South Wales, and in North Wales, Newborough Warren National Nature Reserve in Anglesey which is often carpeted with Marsh Helleborines in July. 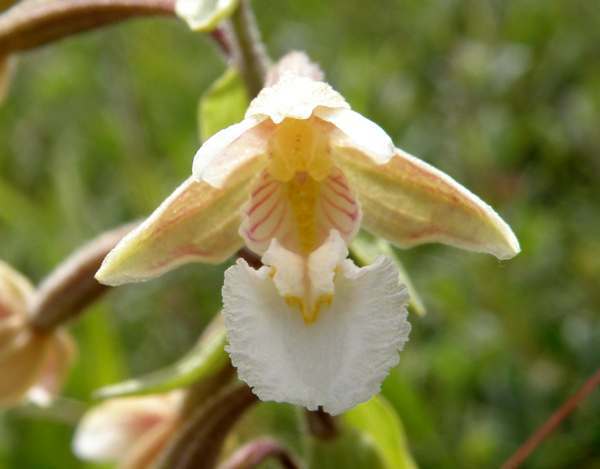 Marsh Helleborines are also found in many European countries including Scandinavia, the Baltic States, Slovenia, northern parts of Spain and Portugal and as far south as southern Italy and parts of Greece. This plant thrives in habitats which are usually submerged with water during the winter and maintain high levels of moisture during the summer. 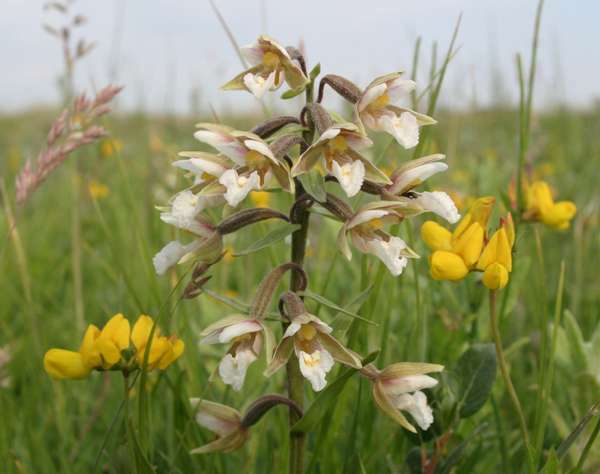 Dune slacks are often home to vast colonies, as are fens which are fed by alkaline springs running through limestone rocks - chalk being the other essential element to enable the Marsh Helleborine to flourish. A closeup of Marsh Helleborine reveals the dark markings at the base of the flower lip and the frilly nature of its outer edge. Epipactis palustris comes into flower in late June and persists until the early part of August. The specimens above were photographed at Newborough Warren National Nature Reserve, Anglesey,in July. 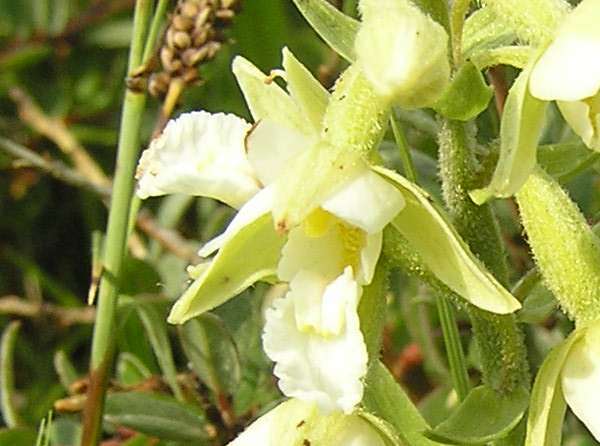 The pale creamy-green form of Epipactis palustris. This colouring is less common in most parts of Britain, where it occurs among colonies of the brownish-purple flowers.